Confusion in the first mile threw much of the leading Marine Corps Marathon pack into chaos, but Arlington’s Desta Morkama eventually overcame a nearly-two-minute deficit, and up to an extra half mile, to win in 2:25:14. Meanwhile, Fairfax’s Sarah Bishop turned a 22-mile training run into a near-Olympic Trials qualifying time (2:45:06). This all followed a 10-minute delay to allow a suspicious package to be cleared from the course. Arlington, Va. and Washington, D.C.
As runners streamed into Rosslyn in the second mile, Arlington’s Kieran O’Connor held a 30-second lead. He looked back as he turned left onto Lee Highway and resigned himself to wondering about how it happened for the next two hours as he tried to pull off a long, lonely win. “If there’s anything I’m bad at, it’s running alone,” he said after the race. Half a minute later, a large pack of hopefuls gave chase and still later, two men wearing green, Morkama and D.C.’s Jeff Stein, 31, frantically tried to make up ground. The marathon begins on Route 110, using both directions of the divided road to carry more than 20,000 runners. O’Connor started on the right, northbound side of the road. Morkama, Stein and the rest of the top-tier contenders started on the left, southbound side. The lead vehicles were all on the northbound side, and Stein said there didn’t appear to be any markings or course marshals directing runners as they headed up 110, so he and Morkama continued ahead, climbing a ramp. “We were passing over another road and I could see Kieran down there,” he said. Soon after, they came across an Arlington County Sheriff’s deputy parked across the road and he told them they were about to hit an interstate. Rather than follow Route 110, they had climbed the I-66 offramp. Stein estimated the extra distance he and Morkama ran added up to a half mile. Second place finisher Wesley Turner, 31, of Danville, Va., was among the runners who followed Stein and Morkama, but turned back earlier. Turner’s GPS data showed him leaving the course at 8:09:26 a.m. and rejoining it at 8:09:56 a.m. Stein was not wearing a GPS watch, but the sight of him coming down the offramp led one runner to initially suspect he was joining the race without crossing the starting line. Hours after the leaders finished, Race Director Rick Nealis had not heard any reports, nor had received any protests, regarding course problems in the first mile. “We had some handcycles go off course and have to be directed by motorcycles, but no runners,” he said, acknowledging that there was only one set of lead vehicles on Route 110. O’Connor went about running the best race he could, leading more than a dozen miles earlier than he had hoped. At mile 16, he had a 1:47 lead on Morkama and Stein, who caught up to the main chase pack by mile 5, and were moving to close the gap after the halfway point. In mile 17 Morkama dropped Stein and started to reel in O’Connor. “I felt okay through 20, but once I hit the bridge I started to get dehydrated,” O’Connor said. 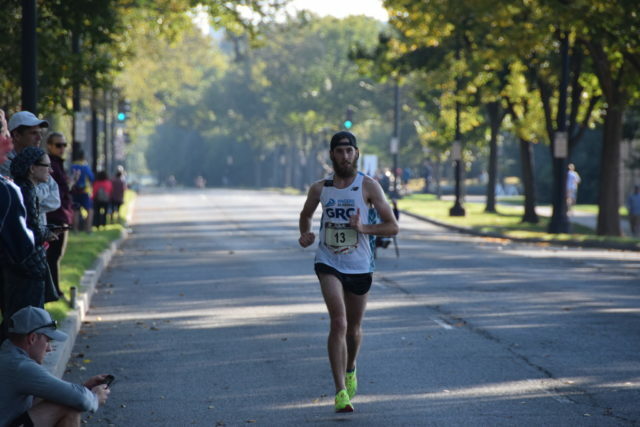 When he came out of a turnaround in Crystal City at mile 22, O’Connor was close to passing out, and he made finishing, not racing, his priority. Morkama passed him shortly after, roughly the same place Morkama, nursing a quad injury, fell back during last year’s race on his way to a second place finish. 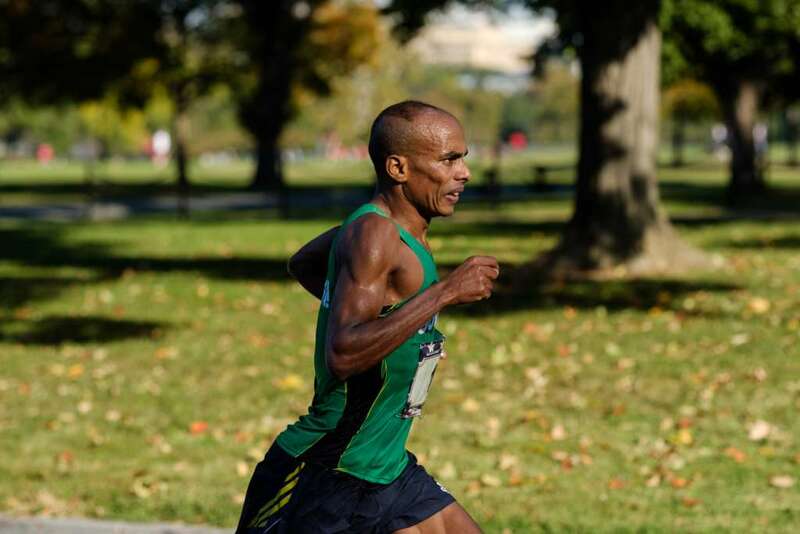 A member of the Ethiopian Oromo minority group, Morkama came to Arlington last year to escape persecution and quickly established himself on the road racing scene. After recovering from his quad injury, he picked up his training and racing in the last few months, including wins at the Annapolis 10 Miler and Parks Half Marathon, though he also won the Lower Potomac River Marathon in March and the Potomac River Run (May) and Abebe Bikila Day International Peace (September) marathons on the C&O Canal Towpath. Through late October, he tops RunWashington’s Runner Rankings. Despite his 2:13:48 marathon PR from 2013, Morkama often relies on his kick to wins races, but that wasn’t possible at Marine Corps, with O’Connor out sight for most of the race. Throughout the race, his expression telegraphed the intensity of someone who knew the race wasn’t over before he crossed the finish line. Turner ultimately passed O’Connor, who had slowed to a jog, shortly before the 26th mile mark, and cruised into the finish in 2:27:35. O’Connor followed in 2:28:07. Turner was making his return to Marine Corps after running 3:29:32 at age 22 in 2008. Stein finished eighth in 2:30:52, then spent the day in the hospital after suffering heat stroke. Morkama won’t have much time to recover before hitting the roads again in the New York City Marathon. He and Bishop gave the D.C. area its first double win at Marine Corps since 2005. Several former winners were in the race, including Trevor LaFontaine (2015) in 12th in 2:32:00, Ruben Garcia (2005 and 2006) 25th in 2:40:01, Charles Ware (2011) in 36th in 2:44:13 and Darrell General (1995 and 1997) 999th in 3:35:33. With the Metro system opening early, the course was restored to its 2013-2015 configuration with two miles out and back on the parkway. So, too, was the 10k course, which Arlington’s Denzel Ramierez covered in 32:17 to win by 5 seconds.